John Farleigh, wood engraver, illustrator, poster designer. John Farleigh was born in London. Farleigh left school at 14 and enlisted as an apprentice at the Artists’ Illustrators Agency in London, applying himself to lettering, wax engravings and black and white drawings, intended for advertising. He also attended drawing classes at the Bolt Court School. In 1918 he was drafted into the army and served until peace was declared in November of the same year. He resumed his apprenticeship and was awarded a government grant enabling him to enrol for three years at the then London County Council Central School, now Central School of Art & Design .The teaching staff included Bernard Meninsky and Noel Rooke, who taught him wood engraving. Between 1922 and 1925 Farleigh was an art teacher at Rugby School but returned to London to teach at the Central School of Arts & Crafts where he taught still-life drawing and later, illustration & wood engraving. Farleigh, a founder and long-time Chairman of the Crafts Centre of Great Britain, his influence on the standing of art in Britain was enormous. He was a tireless in working for commercial publishers and for London Transport far more than for private presses. In 1941 he was commissioned by the British Council to design the title page of the catalogue for Exhibition of Modern British Crafts, but he was also a deep-thinking artist who constantly experimented to produce works in a variety of styles that showed his fluid and brilliant use of line. Farleigh’s work was widely exhibited. 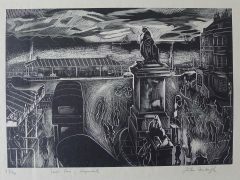 He exhibited at the Leicester Galleries, Manchester City Art Gallery, Royal Society of Painter-Etchers and Engravers, Royal Scottish Academy & Cooling and Sons Gallery.